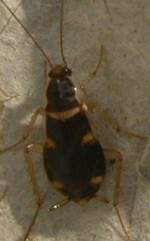 Male brown-banded cockroaches have been observed to fly indoors. Among cockroach species, brown-banded cockroaches have the most distinctions between sexes. Females have larger abdomen and shorter wings than males. Brownbanded cockroaches often hide their egg cases in or under furniture.